What Choice Do You Have for Portland Therapists? I was talking with a client the other day and we had an interesting conversation. 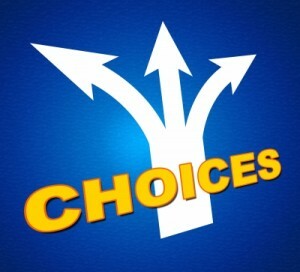 The idea of choice with therapy. Yes, you choose the therapist you work with. You may interview a couple to find a good fit. You may work with one, something may happen and you go to another therapist. * You are the initiator of the process. You reach out to someone who you think may be able to provide guidance and support through something you are dealing with. There is another side of the coin. The therapist also chooses. It may not be a good fit for the therapist for a variety of reasons. What you are dealing with may be out of their schope of practice and expertise. You may also be looking for something the therapist doesn’t offer and they refer you out. Things change through the time you are working together and someone else may be a better fit for what you are currently going through. The client may be pushing certain boundaries the therapist has set, for example cancelling more than coming in. Therapy and coaching are a two way street. It is a choice on both sides. Start the therapy process and choose to call for more information on cognitive therapy – Portland, Oregon. *I do encourage you to talk with your therapist if something comes up that causes to to change therapists. I think there is a lot of value in you advocating for yourself. We are therapists and can pick up on a lot, and we also miss things and make mistakes. It may be hard to bring up the topic as conflict/disagreement is not something that most of us are taught. This allows a conversation (ideally the therapist would not be defensive or judgemental) adn the possibility of the bridge being rebuilt. And you may still choose to change therapists. Photo compliments of Stuart Miles at freedigitalphotos.net. This entry was posted in coaching, therapy on January 29, 2016 by sparkfinder.